I-DOP™: A proven 4-step framework to put your data into action. The ProCogia difference is our I-DOP™ Framework, a holistic methodology that applies business, technical and mathematical expertise to your company’s various data elements. 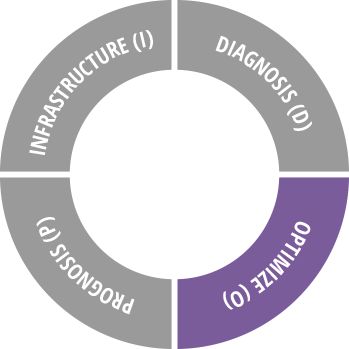 The I-DOP™ Framework guides ProCogia’s deep engagement at four critical stages. It delivers a comprehensive, flexible solution that puts your data to work today, and provides the big-picture business intelligence you need to confidently take on tomorrow’s challenges and opportunities. I – INFRASTRUCTURE: UP, RUNNING, AND INFORMING. In this initial phase, ProCogia implements the foundational data warehousing with on-premises and cloud infrastructure solutions to create a consistent, accurate data layer. Driven by your most critical business needs and objectives, this gives you an initial view of your data, and provides a solid foundation for the subsequent phases of I-DOP. D – DIAGNOSIS: WHAT’S HAPPENING AND WHY? ProCogia performs exploratory and deep-dive data analyses to track both your positive and negative business outcomes. This diagnosis uncovers the behavioral, logistical and other factors that influence these outcomes. We also take an agnostic approach to designing front-end tools and dashboards that make your data readily accessible and meaningful to your team, regardless of whether you’re currently deploying Tableau, Power BI, Shiny or other technologies. O – OPTIMIZATION: A 360-DEGREE VIEW OF YOUR BUSINESS. At this stage, ProCogia helps you identify business triggers, indicators, and market forces that are currently impacting your business. ProCogia’s modeling methodology enables you to focus on the most effective strategic and operational adjustments you can make now, expediting the return on your data investment. P – PROGNOSIS: PROACTIVE BEATS REACTIVE. Now your data acquisition and analytics solution is robust and finely tuned to tackle your most complex “What if?” scenarios. The goal of ProCogia’s predictive analysis is to help you seize emerging opportunities, while enabling you to better foresee developments such as shifting customer preferences, supply-chain disruption, or a competitor’s next move.